Submitted 3 years 2 months ago by Gateway. Barrel: A proprietary blend of Hammer forged chrome molly vanadium made by FN that is referred to as "Machine Gun Steel" by virtue of its required use in FN's M249 and M240 weapons. The hammer forging process work hardens the steel, making it more durable. In addition, the chrome process for the bore allows for a lining almost twice as thick as a standard M16 for enhanced durability. Chambered in 6.8 SPCII, with a 1/11" twist, M4 barrel extension, and a Mid-length gas system. The modified A2 profile barrel is Mil-spec phosphate coated, High Pressure tested and Magnetic Particle inspected. Barrel is finished off with an F-marked front sight post with sling swivel, standard handguards and an A2 flash hider.Upper: Forged 7075-T6 A3 AR upper is hard coat anodized black for durability. Featuring T-marks these upper upper receivers are made for us right here in the USA. Each upper is assembled to order with US-made parts, and test fired to check gas function. Does not include bolt carrier group or charging handle. 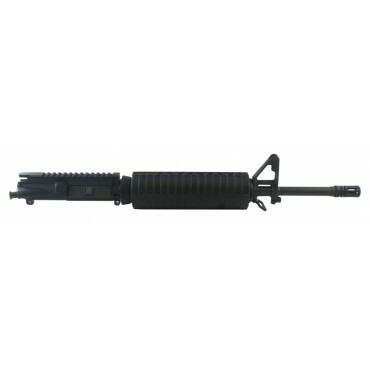 *Please allow up to 15 business days for your Complete Assembled Upper to ship from our facility. Holiday and special lead times can be longer*Shipping labels are created shortly after orders are placed. Shipping labels update when the product leaves our facility and are en route to their destination. You will be emailed tracking information when the order leaves our facility, however if you receive one shortly after you place your order and it remains dormant, don’t be alarmed. Your tracking information will be updated when it leaves our facility and is still subject to the aforementioned lead time. If your tracking number goes beyond the listed lead time please get in contact with us via email or phone and we will look into your issue. Signature required on delivery.